I hope we gave ThingTwo a weekend to remember. 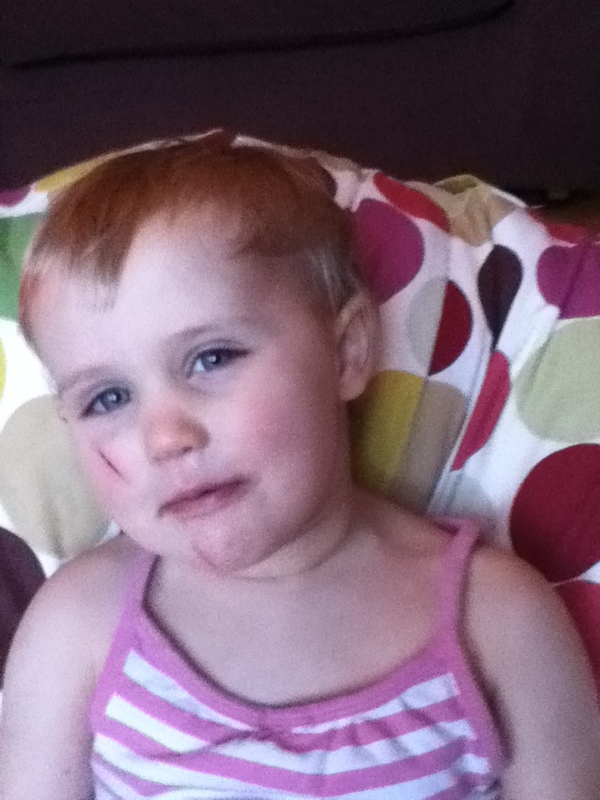 She jumped in puddles, had a mini party thrown for her, including face painting, watched Dumbo, went swimming with her family, went out for lunch with Granny KT, had a visit from her Auntie Lindsay and Uncle Chris, and ran into a door frame cutting both her cheek and her chin. She's the girl who has everything! She got out of bed on Saturday morning and staggered straight to the height chart on the side of her wardrobe where we measure the girls at six month intervals. She was a little distressed she hadn't grown noticably. "Why I not big?" Little oddball. In bed on Saturday evening she was concerned that all her toes weren't now suddenly big toes. I can only begin to imagine what she thought would happen to her on her third birthday. We've been telling her for a while she'd be a bigger girl when she was three. Not hard to lay the blame firmly at our door. She is now planning her fourth birthday party, and asked me this afternoon to write some invites for Lindsay and Chris.